Three days: 9 am 1st day through 6 pm 3rd day. Use of the Mills Hall (upper level). Tables & chairs: available at no extra charge (on-site use). MILLS HALL: 60' round tables(15) and upholstered chairs(150). 8' rectangular tables are also available. 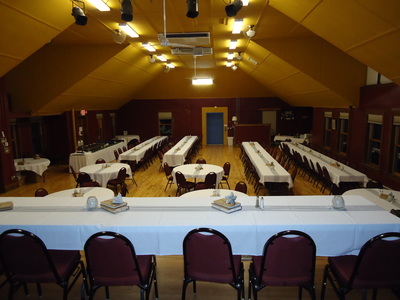 MEETING SPACE: 8' rectangular tables and folding chairs(50). Use of refrigerator, freezer, and counters in the kitchen is included with the above rental rates. Rate for full kitchen use is listed below. Includes: Refrigerator, freezer, stove, and oven. Refundable if rented area is cleaned up after use and no damages are incurred. PR for events is the responsibility of the renters. The Mills may place information for public events on website. 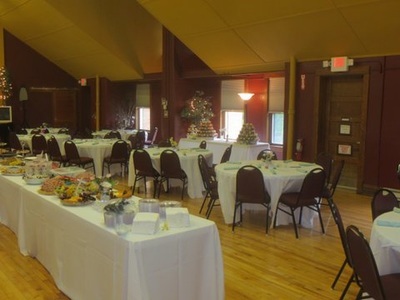 Two locations in the Mills Community House are available for rent: the Meeting Space in the lower level and Mills Hall on the upper level. The middle floor is leased by the Benzonia Public Library and is not available to rent. All areas are handicapped accessible with an elevator serving all three floors. Adjoining kitchen with range, commercial refrigerator, freezer, spacious work area, and direct entrance/exit to the parking area. 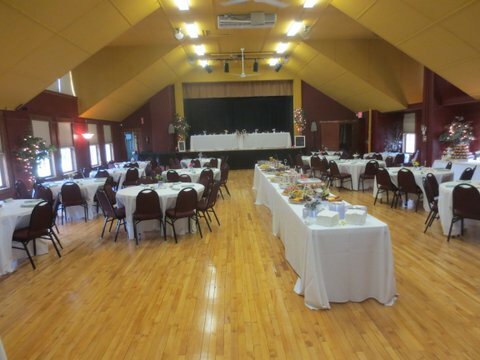 Banquet seating at 8' rectangular tables with folding chairs accommodates up to 50. Maximum room capacity is 100 (not seated). 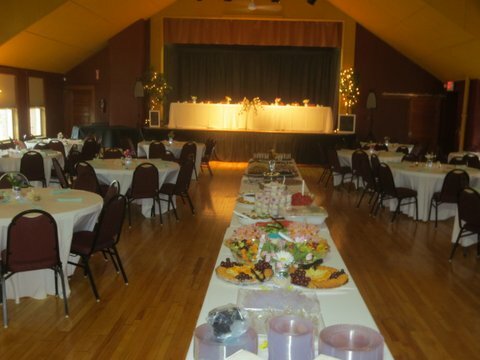 Banquet seating comfortably accommodates 120 guests at our 60" round tables with upholstered chairs. 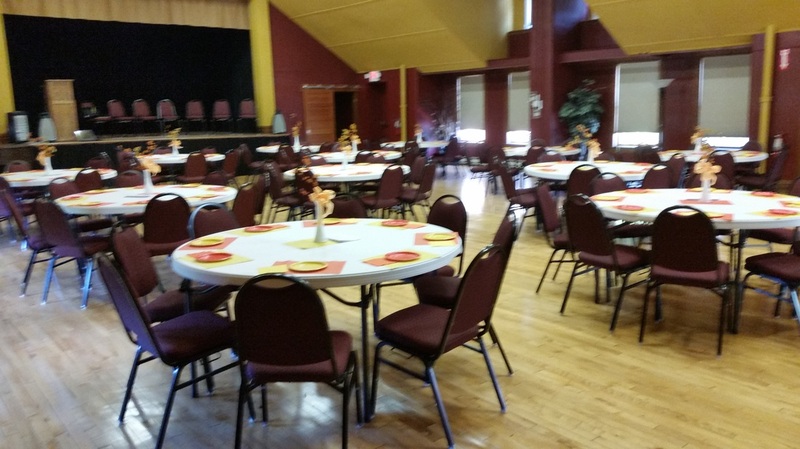 Additional chairs and 8' rectangular tables are also available. Theater style seating easily accommodates our 150 upholstered chairs. 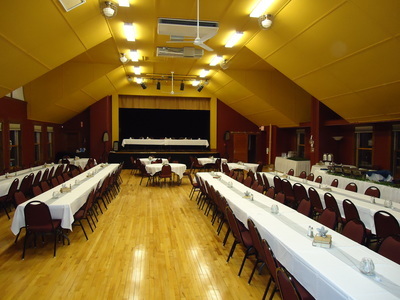 Additional folding chairs are available for a maximum capacity of 180 (200 including stage area). Refurbished stage with basic stage lighting and sound system. Access to kitchen and restrooms on lower level. Spacious work area, and direct entrance/exit to the parking area. All events must end by 11:45 pm including clean-up. All set up and tear down for tables, chairs, etc. Floors: Ensure floors are clean; swept. Kitchen: All areas used must be cleaned, including counter tops, refrigerator, coffee makers, sinks, stove top, and ovens. Garbage: Place trash in garbage receptacle behind the building. All trash that doesn’t fit must be removed by renter. Items Brought In: Food, beverages, decorations, and other items brought to the event must be removed from the premises by end of rental period. The Mills Community House has been available for community use for over 100 years and continues to be a gathering place for a variety of organizations and events. Come visit us to find the best space for your next business or club meeting, party, shower, wedding reception, concert, fund raiser, rummage sale, dance or other special event. M-115W. A large parking lot adjoins the building, with additional parking available nearby. Next to the grounds is a public park with playground, tennis courts, and softball diamonds that are converted to an ice rink in the winter. an invoice will be sent once the rental agreement is received and accepted. Renters who plan to serve alcoholic beverages at their events will need Host Liquor Liability insurance in the minimum amount of one million dollars ($1,000,000) for the event, with Mills Community House Association named as an additional insured. Proof of insurance must be received by Mills House at least 30 days prior to the event. The sale of alcoholic beverages is not permitted without a liquor license issued by the State of Michigan. The Renter agrees to abide by all Federal, State and local laws concerning the sale, service and consumption of alcoholic beverages on the premises. If food is going to be SOLD at your event (includes donation pricing), a Temporary Food Facility permit from the Health Department must be provided at least 30 days prior to the event.